Yad L'Achim rescues widow abandoned by her Arab in-laws and Jewish family and helps them rejoin the Jewish community. 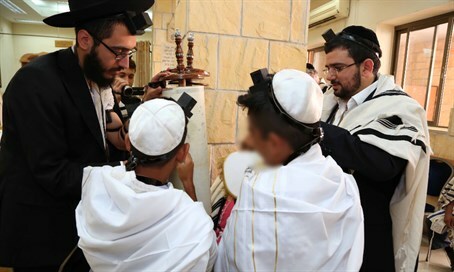 A set of twins from a mixed Jewish-Arab marriage celebrated their Bar Mitzvah this week, after being rescued by anti-assimilation group Yad L'Achim. The mother married an Arab, moved in with his family, and had four children with him, the organization noted. After her husband died of alcoholism-related complications, she was left alone, having been abandoned by both her Jewish family and her in-laws. The woman wanted to return to Judaism but didn't know where to begin. Her daughter came to the rescue, phoning Yad L'Achim's hotline with a plea for help. "My mother is determined to make her way back to Judaism, despite the difficulties," she said. "She's even moved to the south of Israel to be able to raise her children in a Jewish environment so that they can grow up as faithful members of the Jewish people. But she needs help." Yad L'Achim responded immediately, pairing the mother with one of its most experienced social workers. "In our initial meetings, she couldn't stop talking about what she'd been through," the social worker stated. "She spoke of a difficult childhood that led her to enter into a relationship with an Arab, about how her Jewish family severed ties with her and about the challenges of raising children by herself. I reassured her that from that day on she was beginning a new chapter in her life." Yad L'Achim found someone in that Negev town to take the woman and her family under their wing. In addition, mentors were found for the children, including twin sons who were nearing Bar Mitzvah age. The mentors taught the boys how to put on tefillin and how to read from the Torah. Yad L'Achim purchased tefillin of the highest standards for the boys, which they began wearing daily this week after celebrating their Bar Mitzvah. The boys read from the Torah with precision and meaning in a most moving ceremony. The emotional highlight came when two of the boy's uncles, their mother's brothers, entered the shul to participate in the event. These brothers had joined the rest of the family in writing off their sister. But after much effort made by Yad L'Achim to get the family to reestablish ties, the brothers broke down and agreed to grace the double Bar Mitzvah with their presence. For the mother, the celebration marked a new future for her Jewish sons and a new beginning in her efforts to reconnect to her family.